I took a few moments today to erase or move some old pictures I took on my Blackberry to my computer. Along the way I came across this picture I took of Lilly on a trip we took to Cabela's back in April. 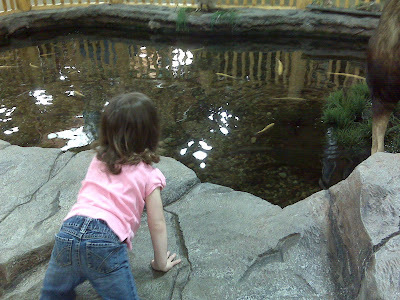 Lilly really liked looking at all of the "stuffed animals," and here's a picture of her getting ready to jump into the trout pond.